Details from the page: Join us at the New Hampshire State House in Concord as we celebrate our accomplishments and send a clear message: We've Only Just Begun! This year, the march will celebrate the incredible progress we have made over the last two years, both nationally and in the Granite State, to advance and protect our rights. We will unite once again to send a clear message that we’re not going anywhere, and that we won’t stop fighting until we have true equality! 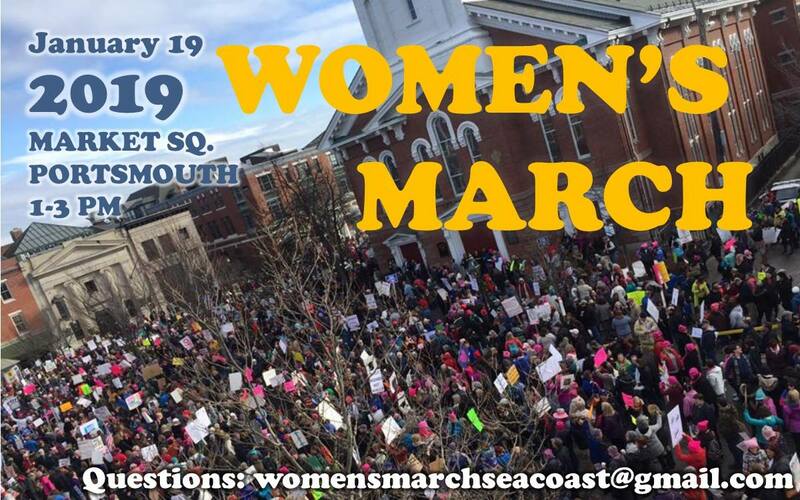 Details from the page: The NH Women’s March is an empowering event in support women's rights, human rights, social and environmental justice. The Portsmouth event is hosted by several grassroots organizations with deep roots and commitment to advancing these values in our community. 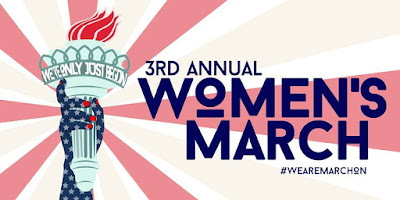 ***************************************************************************** There will be speakers at 1 pm followed by the magnificent Leftist Marching Band! It's been one year since the Women's March! Last year some of us marched from the Lincoln Memorial to the White House, some of us went to New York or Boston or Concord. Over 3,500 of us came out and closed down the roads in Portsmouth. As bad as things are imagine how bad things would be if we hadn’t marched! We need to march again! 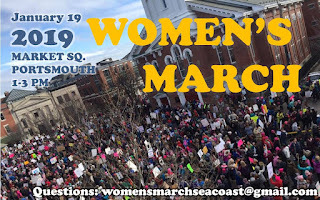 As a show of solidarity, to demand our rights to safety and health, as well as demonstrate our strength and courage, we'll be having another event here in NH that everyone is welcome to. This is an INCLUSIVE event, and EVERYONE who supports women's rights and human rights FOR ALL are welcome. Invite your friends, family and co-workers. Spread the word!. We'll be gathering in front of North Church, Market Square. If you’d like to help us organize please message us here! This is an event for ALL, including: women, girls, gender non-conforming, men, boys, trans, people of every race, religion and nationality, refugees, Immigrants and citizens, The LGBTQ+ community, people with disabilities, climate change advocates, veterans, Native Americans and anyone else who wants to come out in support of all of our rights The Women's March 2019 is being organized by Occupy NH Seacoast and if there are other organizations that wish to step up and join us they can message us here. Please take a moment to mark if you're coming or interested and invite your friends!. We need your help to make this a success and FB now limits the number of people we can each invite. Portsmouth Trolley Schedule! http://www.coastbus.org/trolley.html Please keep in mind we want to be able to continue actions like this in Portsmouth, so we're asking that everyone be sure that we do not leave any trash behind and leave Market Square as we found it or better.